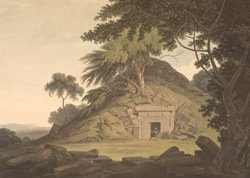 Plate 13 from the fifth set of Thomas and William Daniell's 'Oriental Scenery' called 'Antiquities of India.' This Shaiva temple on the Mundeshvari hill near Ramgarh (not Chainpur) is one of the earliest standing Hindu temples in Northern India as recorded by the discovery of an inscription dated AD 635. The superstructure that originally covered the temple had already collapsed when seen by the Daniells. The remains have now been restored.